Disclaimer: Please note that this content is provided for informational purposes only and should not be relied upon as legal advice or to determine how GDPR might apply to you and your organisation. We encourage you to work with a legally qualified professional to discuss GDPR and how it applies specifically to your organisation. From May 25, 2018, the European Union is introducing new regulation called General Data Protection Regulation (GDPR) that affects the way personal data is collected and processed. You can get all the details about GDPR here. In short it makes the process of personal data collection and processing more transparent to the individual. If data is being collected and stored, the individual providing the information needs to be aware of it and give permission before any action is taken. Generally, GDPR requires site owners to adhere to a set of rules, when it comes to how personal data is handled and stored. First of all, since Users Insights shows user data from many different sources, including WordPress core and other plugins, it is important to understand where this data comes from and how Users Insights handles this data. Now let’s take a look at how each of these types of data are handled by Users Insights. Users Insights directly reads the available WordPress core data from the database. It does not make any copies of this data in other tables and it does not send this data to any external services. This means that the WordPress core is responsible for providing GDPR compliance tools to handle the personal data that it stores by default. Similarly, for 3rd party plugins, Users Insights directly reads the data that is stored in the WordPress database. Users Insights does not store any copies of the data in other database tables and it does not send this data to any external services. Therefore, GDPR compliance of the 3rd party plugins user data is a responsibility of each of the plugins respectively. This is probably one of the main advantages of using Users Insights. 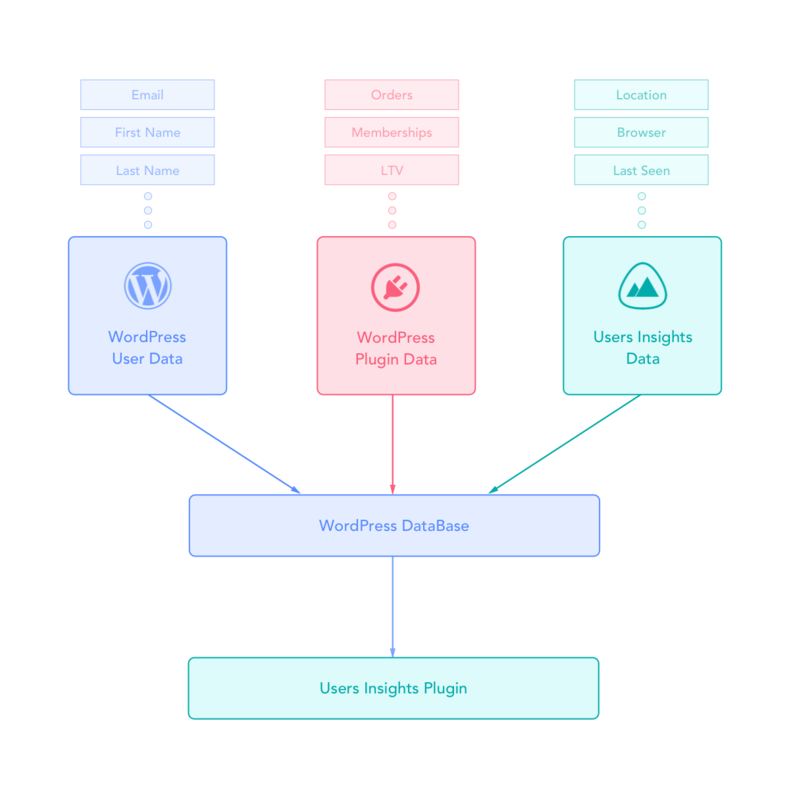 Unlike other solutions, that send copies of the plugin data to their own servers, Users Insights only reads the existing data directly from the WordPress Database. Nothing more. Geolocation data – IP based geolocation, which stores the following data: country, city, region, coordinates (used in the maps) and hashed IP address (used to check for IP address changes). When Geolocation is active, the plugin will send a request to the usersinsights.com Geolocation services, containing the IP address of the user, in order to detect the user location. All of these elements are optional and it’s up to you to decide whether to make use of them or not. It is important to mention that not every element is considered personal information or personally identifiable information. In many cases, that would depend on your specific use-case. 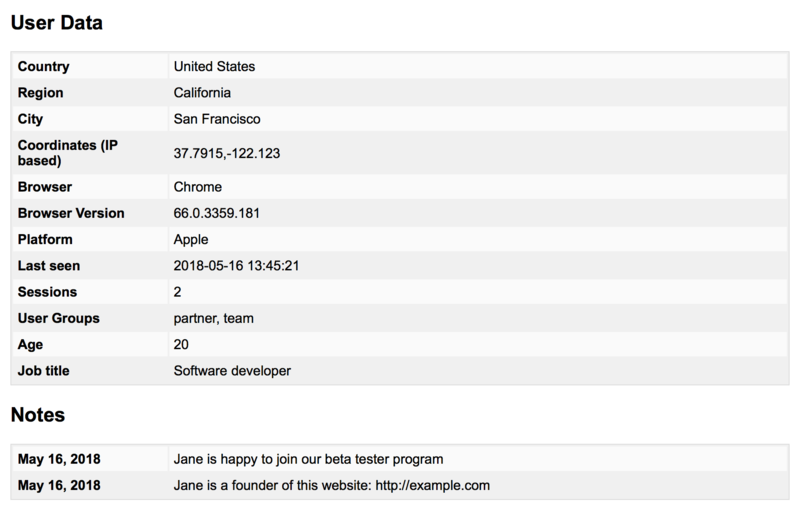 For example, if you are using using user groups, such as “lead” or “beta tester”, it’s most likely that this data is not considered personal information. However, if you are using custom fields to store the user’s age or phone number, this is personal information that should be handled according to the GDPR rules. We recommend consulting with a lawyer to assess what kind of data each element stores on your site and whether this data will be considered as personal information. Users Insights 3.6.3 ships with GDPR tools to handle the Users Insights data. In order for these tools to be available on your installation, you need to have WordPress 4.9.6 or newer installed, which supports the WordPress core privacy tools. In the following sections, we are going to describe each of these tools in detail. The following screenshots illustrates an example of the Users Insights data from the generated export file. As you can see, we have selected to export the data from all the user detection modules (geolocation/activity/device info), as well as user groups, custom fields and notes. that’s why it is by default excluded from the export file, however you could include it if you wish to. 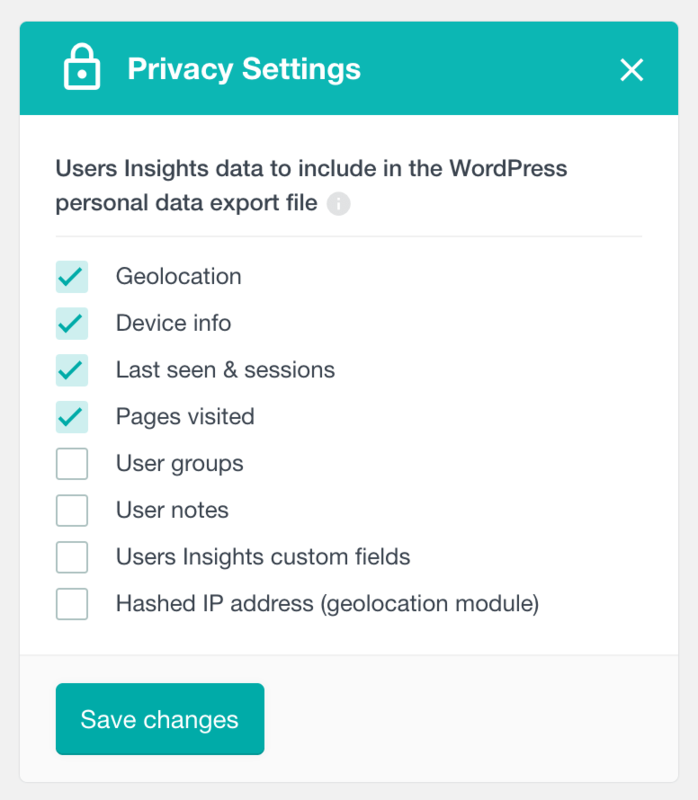 Another privacy tool that ships with WordPress 4.9.6 is the Personal Data Eraser. As its name implies, it allows removing the personal data of a selected user. This is different from user deletion, since the user will still exist in the database after the erasure request is completed. The goal of the erasure is to remove any existing personal data associated with the selected user. Users Insights allows you to select which Users Insights data to be deleted upon a Personal Data Erase request. 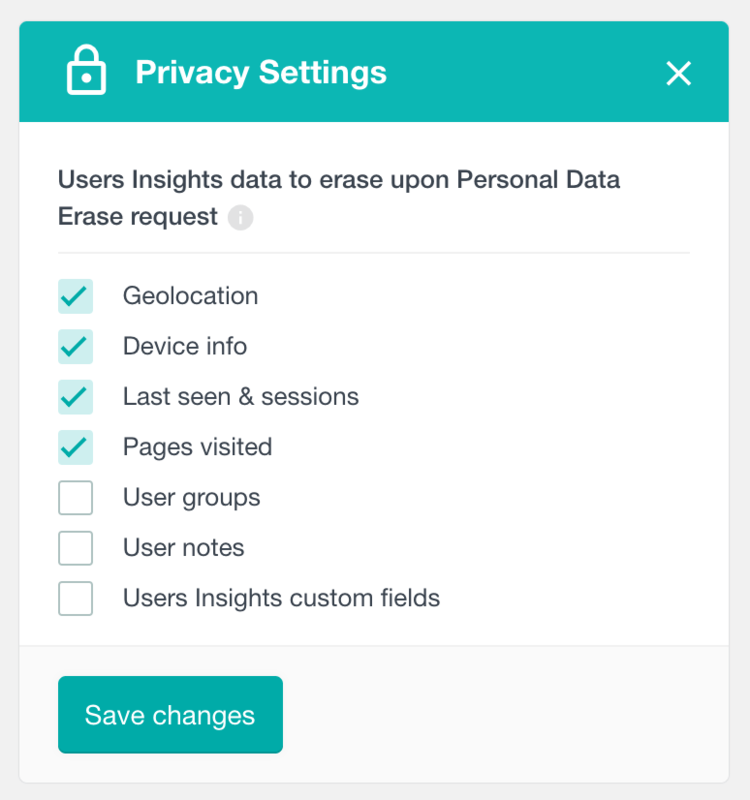 By default, the geolocation, device info and activity data will be removed (when they exist), however you can configure this in the Users Insights -> Module Options -> Privacy section. It’s important to mention that, at the point of writing, custom fields with type “Date” are not removed. This is because date fields are read-only in Users Insights, which means that they are not populated from the Users Insights interface, but from another code, such as a 3rd party plugin. Therefore, the code that populates these fields is responsible of handling the erasure of this data. In this section, Users Insights suggests including the detection and storing of user data, when any of the Geolocation, Device Detection, Page Visit Tracking or Activity modules is active. You also need to state the reason for detecting this data. Users Insights cannot suggest the reason for you, since every site has a different reason for collecting this data. If you do not have a good reason for using Geolocation, Activity and Device detection, we recommend keeping the corresponding modules inactive. The following example illustrates deactivating user detection for users who do not have any value with key “consent_given” stored as user meta. Important: We recommend adding the filter code to a plugin, instead of your child theme. That’s because this filter runs on the WordPress “wp_login” and “set_current_user” hooks, which in some cases, such as in the admin dashboard are executed before loading the theme files and in cases like this, your code will not be executed. Since plugin files are loaded before theme files, adding the code to a plugin, would ensure that it is executed. $should_track – boolean stating whether any data should be detected for this user. The value of this parameter is determined based on your Page Visit Tracking module settings.